A long-awaited set of construction projects can finally get underway now that funding has been secured for both. Kivalina is on track to get both a new school and an access road — two things the community's been asking for for years. "I'm excited. Kivalina has been waiting for this for a long, long, long time. Ever since this borough was formed and (it became a) mayor's priority, we were struggling to get to this point in time," said Borough Mayor Clement Richards Sr. "I'm very excited for Kivalina. I'm very happy." While the projects have been in concept form for more than a decade, work toward them has picked up momentum in recent years. The Alaska Legislature appropriated $50.5 million for the new school during the 2016-17 season. It had been looking at options to either repair the current school in its current location or fund an entirely new school at a proposed relocation site for the community. It chose to fund the latter option. One of the caveats of the state funding was that the borough had to come up with a 20 percent local match, which has been a challenge. Several local city, corporate and tribal entities are splitting much of the cost, with the borough picking up the remainder of the match amount. "Back in (spring) we went to the bond bank to get bonds for the school and that was part of the strategy that I used to move this project forward on the road," said Richards. "Because the school at the time — the state was saying that without anything at the end of the road, they can't see building a road at this time. So, to move that along, I went to the bond bank and got pre-approved for the bonds needed for the school." The Municipal Bond Bank Board approved the issuance of $12.4 million in bonds. However, they required that the road be funded first — before the school — which has now happened. Also this year, the state Legislature granted an extension for the school match, which means the project won't have to get re-approved in Juneau just because it's been moving more slowly than other projects like it. 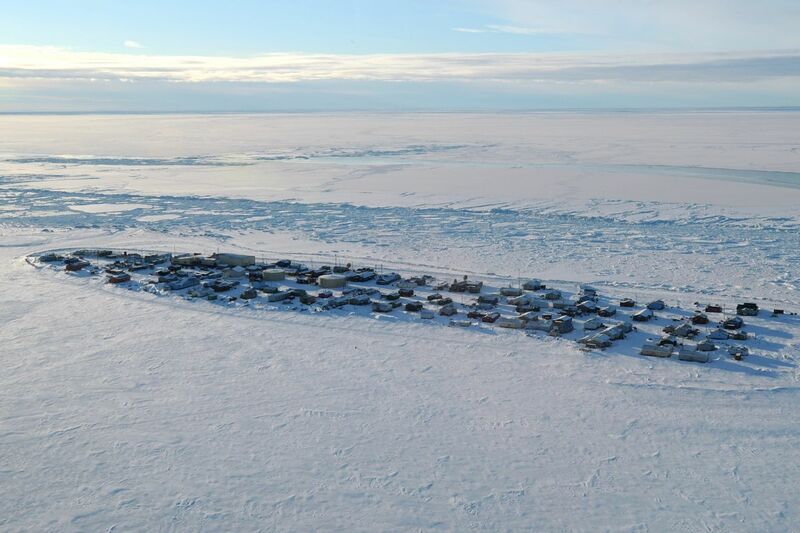 For Kivalina, the construction of a new school on a new site, combined with the access route, means the community is one step closer to relocating. Every year, the village is battered by fall and winter storms that eat away at its coastline and threaten its infrastructure. Even before relocation, residents may be able to use the road to get to safety, if need be, which is why locals have likewise pushed for a resolution to the project's funding needs. Another potential boost to the road project came earlier this year in the form of the military's Innovative Readiness Training. It's the same umbrella project that houses the Arctic Care medical work across the borough. Another facet of IRT is civil engineering. In March, Richards and others consulted with IRT leadership to talk about the possibility of the military using the road construction project as one of its training exercises. The borough formally applied for assistance through IRT and expects to hear back by the end of this month or next month, at the latest. "If that application is approved and if they're able to mobilize, that's a huge cost savings to the borough. Not only would we potentially be able to get our match back, but that's something that we're excited about," said Richards. Regardless of whether or not IRT ultimately assists with the road construction, the project is funded, as is the school, and neither will change. The borough has contracted with Arctic Slope Regional Corp.'s construction arm for on-the-ground services. Richards said he expects to see work on the road start this winter.